My flight was late. That was not surprising – dirigibles are not known for their timeliness. But I was in a hurry to board, and the minutes stretched on and on: sea-salt taffy on a warm afternoon. I had intended to book passage on one of the newer, sleeker airships. The Silver Swan, perhaps, or the famous Eagle of Monmouth. But something about this stately old cruiser appealed to me. Forty years ago she was christened the Jade Dragon for her iridescent sails that resembled great green wings. Nowadays most people called her the Dinosaur. Some even said it with affection. “The Eagle would have been and gone by now,” Jax muttered in my ear, as if reading my thoughts. He shifted his grip on my shoulder, flexing his claws in irritation. “Stop that. You’ll ruin my blouse.” To soften my words, I stroked his ebony mane. He wrapped his tail around my neck and settled his weight more comfortably. A man gave Jax a curious glance before turning back to his newspaper. Saguins were not so unusual now as they once had been, before the war, and the sight of the small, tamarin- like creature no longer attracted stares. A muffled thump announced the Jade Dragon‘s arrival at the platform above us. For the twentieth time today I wished there were windows in the passenger boarding lounge. I would have loved to have seen the grand behemoth sail in. But the height of the platform had caused some passengers early on to suffer severe vertigo, and there were rumors that one had leapt to her death from the open balcony, so the windows had been walled off and replaced with bright, stylized frescoes meant to depict the landscape below. A bell rang. The elevator door opened. Passengers shuffled forward, crowding into the small space. I hefted my suitcase and looked back. 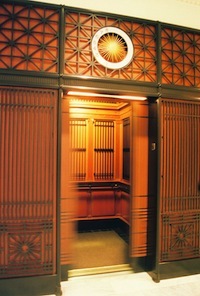 “That’s exactly what I’m afraid of,” I replied, stepping into the elevator. April 11, 2014: This post is the beginning of the Jade Dragon series. It was originally written on August 30, 2012, and quickly took on a life of its own. 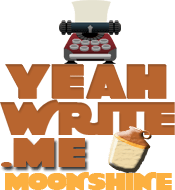 I’m posting it on the moonshine grid at yeah write in hopes that it will prompt me to pick up the story again, and to remind myself that really, I can write more than 42 words at a time! For the Scriptic prompt exchange this week, Michael gave me this prompt: I’m in a hurry.. I gave Grace O’Malley this prompt: Take a familiar book, story, or fairy tale, and rewrite the ending. Feel free to change the setting, time period, characters, etc., as long as the original story is recognizable. Wow. This is fantastic! I don’t know how you can create these details. It’s like you just took this trip. Nicely done! Great job with the prompt. I’m so glad you got it in on time. Like everyone else has already said, you do a great job creating a believable (even in the fantastic) setting. Your strength in writing is definitely with those details. Thanks for showing us all how it’s done! Love the steampunk. Of course. Great way you introduced an established alternate world in so few lines. I love the old-fashioned feeling this evokes, even though it’s clearly not historical. It makes me want to take a trip by train. And acquire a saguin. Me too. 🙂 I have a hard time writing (or reading!) anything else. I liked the era of old fashioned/future you created. Would love to have flown on a Zeppelin… just not that last one. I’m not sure exactly where it came from, but I’m kind of digging it. I really need to get back into it, if I can find the time to do some actual writing! Looking forward to the next installment. Let’s see if I can wait until next week’s moonshine grid.